Another month has come & gone. You know what that means: time for my March blogging income report. I'm excited to say March was my best month of 2017 (so far). I really hope to break the $1,000 threshold sometime soon. Let's look at this month's numbers. Note: I base my income report on earnings that were deposited into my bank account during that month. I did a couple projects in March that have yet to be paid out, therefore I will take that into account for my April Income Report. The only exception to this rule is the $2 from ShopStyle Collective. I only get paid once I make the $100 threshold but thought it'd be misleading to post that I earned $100 from ShopStyle when in fact that was many, many months in the making. March was pretty slow as far as sponsored posts. I had one paid Instagram photo with Secret Squirrel. Their cold brew coffees are scrumptious, so of course I was down to work with them! I also got paid for my January post, A Super Delicious Vegan Edamame Dip Recipe with Best Foods. I published a couple sponsored posts in March (5 Steps to the Perfect Date Night & I'm Going to KAABOO Del Mar (Again! )), but I won't get paid for them until April/May. I'll include them in my income reports as they come in. I mentioned a couple sponsored posts with Linqia in my previous income reports, so a few people signed up with them. I make $5 if someone is accepted into the network (not everyone gets in). Thanks to Linqia's referral program I earned $20. This month was all about coaching, something I started in January. As a coach, I work with people one-on-one to better their blogs, their social media presence, & their brands. I'm excited to make this a regular part of my income! I will continue to include coaching & paid social media posts in my blogging income report because if it weren't for my blog I wouldn't have those opportunities in the first place. I've learned the necessity of dabbling in multiple avenues. Do you want to start making your first dollars as a blogger? I can help! I'm a social media professional & a blogger with over 4 years of experience. I offer consulting & coaching for bloggers & influencers who want to step up their game, grow their brand, enhance their social media channels, & starting making some money. Please contact me for price quotes or if you have questions. Interesting! I never thought about coaching for a blog site! Sounds like a great way to increase income! i love that you are so honest and share this with us! thank you! Congratulations! You're almost at the $1,000 mark - it definitely takes a bit of time and effort but you're on the up and up! 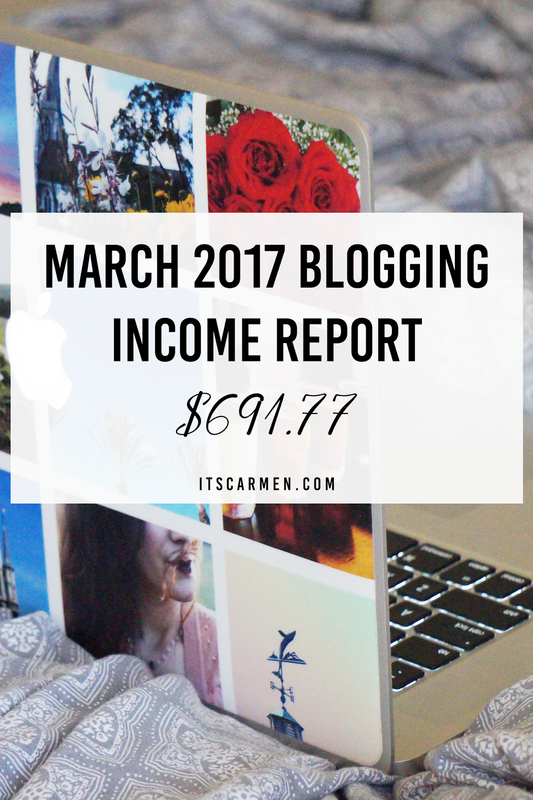 I love reading blogger's income reports because my goal is to make it my full time gig. Have you considered putting up ads? I just switched to Media Vine and make about 4x the amount of Gourmet Ads so far - it's only been a month and a half - and it takes 3 months to see your full potential. I am trying to convince my author friend who has a blog to put them up - every little bit helps! You did so well! I'm proud of you :) Hopefully April is even better! How exciting! You're almost to your $1,000 mark! Good for you Carmen! You're doing so well, and it's inspiring to see you doing this as it motivates me to try and work harder on my blog. I hope April is a wonderful month for you as well! Hey Carmen, congrats on a successful month! Also - I think it's awesome how transparent you are about your blogging income. Great job!! I love reading income reports! Congrats on such hard work and great results! :) Very inspiring! Thanks for sharing this! And congrats on your success! This is super helpful for a new blogger like me to see. Hoping to make a solid blog income like you someday! Good for you! You're totally killing it! Thanks for sharing! It's helpful to expand my thinking on ways to utilize my blog. Congrats on doing so well with everything! Good for you! Keep it up and congrats! Wow. It's nice to see a fellow blogger helping out their peers. I can't wait to read more posts! Gosh I love income reports! This is a fun one - I am SURE you'll be over the $1000 mark soon if you aren't already. How are you finding the sponsored posts? Do you enjoy doing them? Great job! I just started seeing the $ trickle in this month and couldn't be more excited! Excellent work! Congrats on being your best month yet! I have not done many sponsored posts yet. My monthly income comes mostly from ads, which is great because I look at it as almost passive income since it's happening even while I sleep! Thanks for sharing :) Great job!! I love seeing what other bloggers are making, I get so curious! Totally true! Thank you, Dia!